Cognitive Cooking with Chef Watson is a collaboration between IBM and the Institute of Culinary Education in New York City. Once a week, as part of an ongoing series, we'll be preparing one recipe from the book until we've made all of them. Wish us luck. Watson's latest challenge to my self-esteem and sanity, the Spanish almond crescent, is the first dessert in the Cognitive Cooking book. And it's an incredibly challenging one. But, I'll say this up front, if you put in the effort, the payoff is well worth it. These pastries are quite unique and delicious. They're not so surprising that the first bite catches you off guard, like say last week's Swiss-Thai asparagus quiche. But that's a good thing. These little puffs of sweet and savory are different, but approachable; unfamiliar, but comforting. The first thing to know is that this recipe takes forever. The dough needs to rest at room temperature for an hour to bulk ferment. This will introduce some air into the elastic pile of gluten, but it will also bring a little flavor to the party as well. Then you'll need to roll it out into a rectangle and it's into the refrigerator for at least 12 hours, but up to 24. Then you'll need to fold in the sheet of olive oil butter you'll make, which involves turning, folding and rolling the dough, several times over the course of 90 minutes. Then you can refrigerate the dough again if you want or you can get right to assembling the pastries. I suggest you put the dough back in the fridge for at least a little while, however, as it's going to be very soft and very sticky. Chilling it before moving on to assembly will make the dough easier to work with. Oh, once you've finished rolling, cutting and filling the little strips of dough, you need to proof the pastries for another hour. One more note about the dough: It is dense. Like modeling clay dense. After putting together this recipe, I'll have to take my stand mixer in for repair as it seems like the dough managed to bust a gear in my KitchenAid. The flaky, almost puff pastry-like dough brings the sweetness of honey and coconut milk together with the pucker of lemon extract and the savory smoothness of olive oil. That particular profile of flavors carries over to the cream filling, which, again, relies on coconut milk, honey and lemon extract for flavor. But it also incorporates the grassy warmth of saffron and the bite of fresh cracked black pepper which provides a subtle savory backbone. Then you add the dark chocolate, which plays off the sweetness of the coconut milk and the mild bitterness of the saffron and you've got a magical combination that I can't say I'd ever have thought of. So, thank you Watson. Not everything here was pure gold, however. The almonds (I used slivered instead of sliced 'cause it's what I had on hand) don't really seem to add much to the dish. A sprinkle of sea salt and powdered sugar on top, though, was perfection. The bigger problem here is the lack of clarity with some of the instructions. For example, the recipe asks you to make a glaze of coconut milk and honey, but never tells you how or when to apply it. I also ended up with way more saffron pastry cream than needed for the batch of dough I made. My plan is to go out and pick up some frozen puff pastry sheets from the store and hope that the combo of dark chocolate and saffron still work beautifully even if the dough isn't laced with honey and lemon. Once again, though, Watson, with help from his human interpreters, turned out something quite impressive: an unexpected blend of flavors that wasn't in the least bit challenging. And that is evidenced by the fact that my taste testers demolished the entire batch of pastries in two days. The level of dedication need to make the honey-lemon Danish dough means I'll probably never make this particular recipe ever again, but I can't say that IBM's supercomputer let me down. 1. Place the flour and salt into the bowl of an electric stand mixer, and combine well with the paddle attachment. Add the honey, yeast, milk, coconut milk, lemon extract, oil and egg. Mix on low until the mass comes together. 2. Increase the mixer speed and continue to work the dough until strong and elastic (about four minutes). 3. Cover with plastic wrap and allow the dough to bulk ferment one hour at room temperature. 4. 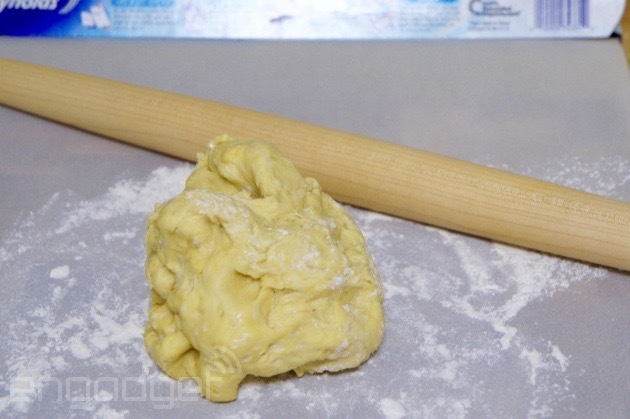 Punch down the dough and roll into a rectangle measuring roughly 8 X 16 inches. Transfer the dough sheet to a parchment-lined baking pan and refrigerate for a minimum of 12 hours, or up to 24 hours. 5. 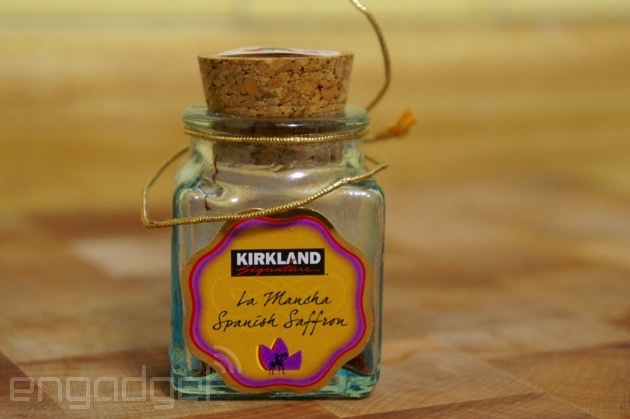 Combine the softened butter and olive oil, and mix thoroughly to combine. Spread the butter mixture onto a sheet of parchment paper cut to 8 X 8 inches, ensuring an even thickness and a clean, square shape. Wrap and chill. 6. To begin the rolling process, place the chilled dough sheet onto a lightly floured work surface and place the butter rectangle over one half of the dough (the rectangle of dough should be roughly twice the size of the butter). 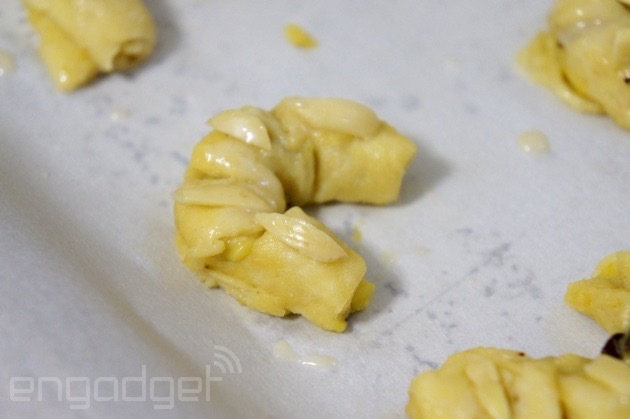 Fold the dough over the butter to enclose, and pinch the edges of the dough together. 7. Shift the dough 90 degrees so that the shorter end of the rectangle is facing you and roll the dough in one direction to create a longer rectangle measuring about 8 X 24 inches. 8. Brush off any excess flour and fold the rectangle into thirds, as one would fold a letter. This is the first single turn. Place the dough in the refrigerator and allow to rest 30 minutes before rolling and completing the second turn. 9. In the same manner as with the first turn, roll the dough to roughly the same dimensions and fold into thirds a second time. Rest an additional 30 minutes under refrigeration. 10. Complete the third and final turn, also with a 30-minute resting period. At this point, the dough can remain in the refrigerator for up to 12 hours. 1. When ready to roll, cut and shape the pastries, divide the dough in half and roll each portion to a rectangle measuring roughly 9 X 8 inches and just less than 3/8-inch thick. 2. Mark 3-inch increments along the length of the dough, and 2-inch increments along the width to create about 12 rectangles. and some of the chocolate along one edge and gently roll, leaving the seam on the bottom. Using a sharp knife, cut four incisions along one edge and pull the ends together to form a slight U-shape opposite from the side where incisions are. 4. Transfer the shaped pastries to a parchment-lined sheet pan, loosely cover with plastic and allow to slowly proof at a warm room temperature for one to two hours (or until nearly doubled in size). 5. When fully proofed, gently brush crescents with the egg wash and top with sliced almonds. Bake in a preheated oven at 350°F 15 to 20 minutes, or until a deep golden brown. Remove from the oven and cool. 1. Combine the milk, saffron, honey and lemon oil in a small saucepot and bring to a simmer. Remove from heat and set aside. 2. In a separate bowl, whisk together egg, egg yolk, pastry flour, salt and pepper. 3. Slowly whisk the hot milk into the egg mixture, then return to stove and cook, stirring constantly until thickened. Remove from heat and keep stirring to cool slightly. 1. Combine the coconut milk and honey in a small pan. Bring to a simmer and cook until reduced by half. 1. Combine the cream and honey in a saucepot and heat to about 100°F. Remove from heat. 2. 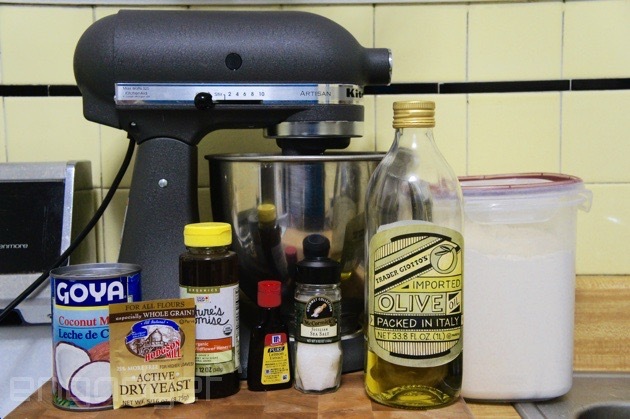 Combine the flour and black pepper in an electric mixer fit with a dough hook. Begin mixing and sprinkle the yeast over the cream. Let stand one minute, then whisk to combine. Beat the egg into the mixture and pour in the liquid ingredients. Mix until the dough forms a tight ball. Let rest 15 minutes. 3. Follow assembly instructions from the previous dough recipe, but do not cut with incisions. 4. To cook filled pastries, heat a pot of oil to 350°F. Fry the crescents for approximately 90 to 120 seconds, turning often so that they cook evenly. Remove to a paper towel-lined tray to drain. This recipe and others can be found in Cognitive Cooking with Chef Watson.